chilli powder | Some More Please! My favourite Indian dish of all time is Butter Chicken or Murgh Makhani; a view shared by many all over the world. “No Butter Chicken, No Business” a manager of an Indian takeaway once told me. 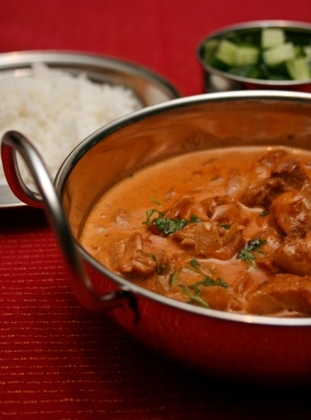 Butter Chicken comes in many variations; some contain cashews while others contain many different spices such as turmeric and cumin. This recipe I want to share is so easy to put together and it tastes amazing… and the aroma! The ingredients aren’t many or complicated so anybody could make this. Best of all this dish is sure to impress anyone. There is nothing more satisfying than cooking something from scratch and not from a bottle. For the meat I recommend using thigh pieces. Thigh meat is very soft and tender when cooked, unlike breast meat which I find too dry. If you are being health concious by all means use breast meat but with such a rich sauce I find it defeats the purpose. All the ingredients should be easy to find; most spices are readily available in major supermarkets. Ghee is a common ingredient in Indian cooking. It is clarified butter and can be found in specialist Indian grocers. It is especially important to use ghee and not regular butter as it significantly affects the taste. Unfortunatley I cannot take the credit for cooking this meal; it was my wonderful Mum who surprised me knowing it was my favourite. I did however do the food styling, the photography and of course the eating! So please, try this recipe out and let me know what you think! Combine garlic, ginger, lemon juice and spices and rub into the chicken pieces. Set aside for an hour. Scrape off any excess marinade and reserve. Fry chicken in ghee until lightly browned. In a heavy pan melt the ghee and cook garlic and onion until soft. Add reserved marinade, tomato paste, salt, sugar and ginger threads. Cover and simmer for 10 minutes. Stir in the cream. Add pieces of fried chicken and gently stir through the sauce. Cook until the chicken is done, stirring occasionally. Sprinkle with garam masala and coriander. Serve with rice or Indian bread.